You can protect tomatoes from pests with companion plants. 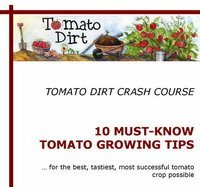 Companion planting is a helpful addition to your plan for a healthy tomato crop. Tomato plants don’t have control over where they live or who lives next to them. They cannot pull up stakes and roots and move to a different neighborhood in the garden. But tomato pests, on the other hand, are mobile. They can bully your tomato plants and cause harm to their leaves, stems, and fruit. Your tomatoes will thank you with a healthier crop when you team them up with other plants that have proven to be faithful friends: companion plants. 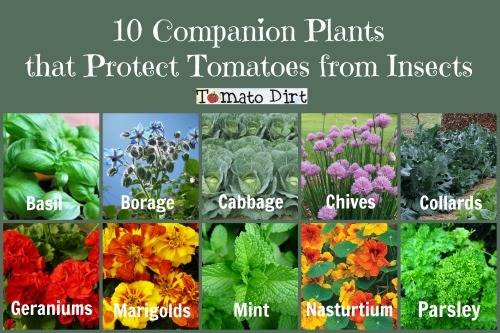 Companion plants are vegetables, herbs, or flowers planted nearby that offer a special benefit to tomatoes. These plants grow alongside tomatoes and deter pests and diseases, improve tomato health, and improve tomato flavor. In short, they behave a lot like good friends. We all know one of the benefits of good friends: they stick up for you when bullies threaten you, often protecting you from getting hurt. Companion plants do that for tomatoes. All kinds of pests prey on tomatoes. Tomato plants are among the favorite menu items for certain insects, including aphids, whiteflies, and different types of beetles. Once these pests flit into your garden and discover your luscious, healthy tomato plants, suddenly it’s Feast Time. But companion plants act as natural defenders against these tomato pests. Some companion plants repel harmful insects. Their presence signals “Keep Away” to tomato pests that can inflict harm on plants. Some companion plants attract helpful insects. These in turn prey on the pests that are destructive to tomatoes, reducing their population and thus their impact. See more about Companion Plants on our Pinterest board.